Lottery is complete. Winners have been notified. Thanks for playing everyone, we’ll do more of these in the future. See this pile of posters, well each one was for sale in a poster purchasing lottery. The rules are simple, but you must follow them exactly to be eligible. You may pick one poster you’re interested in buying, and mention it in a comment to this post. We will randomly select the “winners” on Sunday and those folks will get an email requesting payment. The prints and prices are listed below. Keep in mind one winner will be selected for each print shown (assuming all the prints have takers). We are still working on improving the store experience for a future sale involving the Vedder and Furthur prints. This lottery is just an opportunity to send a small variety of prints out to you good people. Lucky number 7. Eddie Vedder â€“ Brisbane â€“ $90. Marq, thanks for the “Weekend Poster Purchasing Lottery”. I would love the Furthur Terrapin print! I have the WSP Summer, Fall and NOLAween prints framed on my wall! Widespread Panic Fall 2010 please. moe. Denver 2011 copper please and thank you. Mother Hips would be awesome! Eddie Vedder Brisbane…Would love to hang that on the wall!!!! Broadway wellness..to keep me well. I’m sorry Marq, I meant to say the Widespread Cocoa Summer. Please don’t disqualify me. I have the Fall AE. Thanks bro. Eddie Vedder please. Many thanks! The Furthur print is one of the best ones i have ever seen. It would look great hanging on my wall. Eddie Vedder â€“ Brisbane please! J Mascis Purple please. Thanks!! I Love the broadway wellness! I have the blue pearl Ed. And would love to buy the one mentioned in this contest! Aloha, Eddie Vedder Brisbane please. Eddie Vedder please!!!!!!!!!!!!!!!! Good luck everyone!!! EV EV EV EV EV THANKS!!!!!! WOULD LOVE TO SCORE AN EDDIE VEDDER PRINT!!!! GOOD LUCK TOOOOO ALLLL!!!! This is one of the most detailed and beautiful prints I have ever seen done. It brings back the memories of my time spent in Brisbane and the East Coast of Australia. Thanks for the opportunity and look forward to seeing what happens in the future. Got hope for the Eddie Vedder Brisbane print. Had twins born the day of the show and the two owls to me represent them. Thanks for the Chance. Although the odds might be bad for Eddie Vedder – Brisbans, being Australian I will take the chance…..
I’d love to be in the running for the J Mascis, thanks! Ben Harper & Relentless 7 Santa Barbara print for me. Please! Hoping for the Eddie Vedder. Thanks, Marq. Eddie Vedder â€“ Brisbane for me please frame is ready. eddie vedder! pretty, pretty, please!!! I’d like a chance at a Vedder Brisbane. Thanks for this fun op! My choice is Widespread Panic summer tour (cocoa). Thank you for the opportunity Marq, you rock. Ben Harper and Relentless 7 for me… thanks!!! Would love to be able to buy the Vedder Poster. Thank you for the chance. Ben Harper. What an awesome poster! throw my hat in the ring for a mother hips. One of my favorite brews, Punkin Ale.. I can’t believe I still don’t own this print! That grizzly Adams would be sick on my wall! Widespread Panic Summer 2010 (Cocoa), Pa-Leeze! Thanks for the offer, Marq! I would love to get Furthur â€“ NY, NY (AE) â€“ $90! Marq, I would like Griz adamz cause I am one of your hugest fans and also because I’m broke and on my last jar of peanut butter due to my wide spread panic charity purchase. which was certainly for a great cause. J Mascis â€“ SSOW Tour â€“ (Purple Ed. of 22 please. Love a chance at an Eddie Vedder print Marq! Thanks!!!! Eddie Vedder print Marq PLEASE!!! Widespread summer 2010, hometown show danbury, ct. More importantly my 7 yr old son and 9yr old daughters first concert! They need the catapillar on the wall next to spring swing!! Hey Marq, I’d love to grab that Aprihop from you. It’s the only one that I need to complete the DH series! I really want to get these framed up together! shoot – wrong email for the vedder above – this email is right! put email in wrong on previous post. eddie. WSP SUMMER TOUR COCOA PLEASE! I want the Punkin Ale… Yeah! Still short of Aprihop to complete the series. Furthur â€“ NY, NY (AE) , please…. PLEASE help warm a snowy day with a Widespread Panic Cocoa Ed. Thank you good sir. J Mascis please! Thank you! Hey I would looove a Aprihop poster to get help get a complete set!!! Broadway Wellness would be swell! Last one I need to complete the Aussie Tour. i love your work and i love me some widespread panic…hook me up haha. 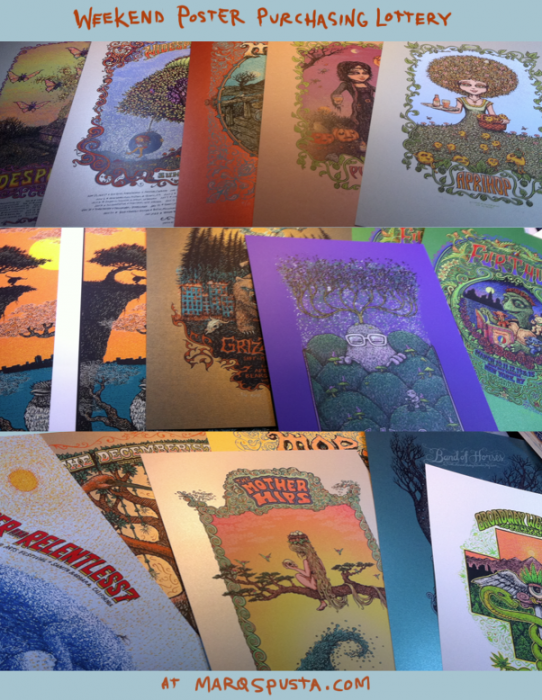 I will consider settling for one of the furthur prints if need be. Would love the J Mascis! Have a spot waiting. Would love to get the J Mascis!! Love your work. vedder hopefully . . . thanks marq! I’ll take a shot at the Furthur print for the lovehause! I’d Love the j. Mascis print!!! Have a Great day!!! Summer tour Widespread panic if its not too late!! Widespread MF Panic Fall 2010 please! Thanks Marq! a little bit FURTHUR than you gone before! The MOE from Denver Copper would be awesome!!! How about you people frame these up and enter the contest he has. We need entries for his sick work. Get on it! This is almost like the Goodie Grab. I was there!! Widespread Panic Summer Tour 2010. Hopefully your working on some awesome posters for Panic 2011.
thanks either way for a fun sale Marq! Going to start picking the winners soon. About halfway through picking winners. If you got a paypal invoice for your poster, you’ve been selected! Winners selected! Lottery is complete. Congrats to the winners! Missed out! Was fun ! Thanks Marq! Oh no. Didn’t see this until just now. Some good stuff there! Woohoo!! I won the AE Fall 2010 WSP!! Thanks Marq,really glad I was able to score one! Thanks for the Cocoa WSP Marq. You will see it in a frame in your contest buddy. You the man! Thanks Marq~Wish U All the Best! Congratulations folks! Looking forward to seeing new prints soon! Congrats to those chosen. Anyone know if those 2 Eddie Vedder prints were the end of what Marq has? I’d like one and if I know I don’t have a shot via Marq, I want to start watching ebay and looking on EB. Thx all! !